Murray is making the jump to the NFL instead of playing for the A’s. Kyler Murray — the Oakland Athletics’ first round pick in the 2018 MLB Draft and the reigning Heisman Trophy winner — announced Monday that he will enter the 2019 NFL Draft. Whether or not that means he’ll postpone or even give up his baseball career for a shot at the gridiron isn’t quite clear yet. San Francisco Chronicle reporter Susan Slusser broke the news that this was coming Wednesday evening, airing out the conundrum that may cost the A’s their shot at the No. 9 overall pick from last year’s amateur draft. He decided on the NFL Combine, according to ESPN’s Adam Schefter. Athletics’ and MLB officials have been working to convince their former first-round pick to abandon the gridiron — but that could be an expensive proposition for the franchise. It’s unclear if there’s a way for Oakland to substantially increase Murray’s bonus without breaking several league rules in the process. Renegotiating the deal the would-be farmhand signed last spring would risk several extremely harsh penalties for the A’s, including a 100 percent tax on any new money and the potential forfeiture of the team’s first round picks in 2019 and 2020. Even trying to meet Murray’s reported new demand could lead to discipline for the Athletics. Major League Baseball, reportedly, is thirsty enough to lure Murray that it’s willing to waive those rules if he decides to ditch football. Major League Baseball would waive a rule that prevents teams from giving major league contracts to recently drafted players if Kyler Murray and the Oakland A’s can strike a deal that would have him choose baseball over football, league sources told ESPN. There’s still time for this to go in a different direction, but it’s looking increasingly like football is in Murray’s future. The A’s report to spring training Feb. 15, and the NFL Combine begins Feb. 26. His decision to visit Indianapolis says plenty. Murray originally planned to play one final season with the Sooners as Baker Mayfield’s replacement after being drafted by Oakland. A $5 million signing bonus seemed to be all the motivation the former five-star recruit needed to leave the gridiron for the diamond. The Oklahoma quarterback had about as great a season as any player who failed to win a national championship has ever had. He nearly matched Mayfield’s numbers on the stat sheet and equaled him in the standings in a 12-win campaign that included a Big 12 title and a spot in the FBS’s final four. That incredibly positive experience has him deciding whether to return the seven-figure payday he earned in 2018 just to prove himself in the NFL. And thanks to the NFL’s recent emphasis on dynamic quarterback play and mobile, dual-threat passers, strapping on the pads could wind up being the right decision. Murray was an accurate college passer, completing nearly 70 percent of his passes with the Sooners and compiling a 45:7 touchdown-to-interception ratio after transferring from Texas A&M. He also lit up opponents on the ground, gaining 1,001 yards and rushing for 12 touchdowns in 14 games last fall. That last part is important. 2018 saw a rising tide of mobile quarterbacks in the league. Lamar Jackson averaged 17 carries per game while leading the Ravens to a 5-1 finish that delivered the team’s first AFC North title since 2012. Josh Allen’s best quality in Buffalo was his ability to extend plays with his legs. Marcus Mariota set career highs in carries and rushing yards to help take some of the onus off his injured shoulder/elbow in Tennessee. That rising tide came thanks in part to a new emphasis on run/pass options, plays that allow quarterbacks to read the opposing defense and dictate plays at the line of scrimmage, often choosing between handoffs, keepers, and passes. Murray has the athleticism and arm to be an electric read option quarterback, and that will make him an asset in a league so thirsty for dynamic quarterback play it just saw Kliff Kingsbury go from fired Texas Tech coach to the Arizona Cardinals’ new HC. So where would Murray fit in the 2019 NFL Draft? Murray can also take advantage of a 2019 Draft class that’s weak on quarterback talent. While five passers heard their names called in the first round of last spring’s event, analyst Dan Kadar only gave three QBs a Day 1 projection in his latest mock draft. That includes Murray’s fellow Heisman finalist Dwayne Haskins from Ohio State, along with a pair of interesting but flawed talents in Missouri’s Drew Lock and Duke’s Daniel Jones. Would Murray join that group? It’s tough to tell. His resume at Oklahoma is undeniable. He averaged more than 311 passing yards and three touchdowns per game while leading the Sooners back to the College Football Playoff. However, he’s also only 5’10 — one inch shorter than Russell Wilson, the league’s shortest starting QB. Wilson came into the league with a resume loaded with elite college production as well (though not a Heisman Trophy), but questions about his size still dropped him to the third round of the 2012 Draft. Adam Schefter suggests scouts see him landing somewhere between rounds one and three, though it’s difficult to gauge any kind of outcome before he throws at the Draft Combine or in private workouts with clubs leading up to the event. Murray doesn’t fit the prototypical build that had scouts enamored with less successful college quarterbacks like Josh Allen and Brandon Weeden in the past, but the league’s recent shift to less traditional passing offenses is an argument in his favor. Oklahoma’s last Heisman winner, Baker Mayfield, just capped a potential rookie of the year campaign in Cleveland despite questions about his stature (though he’s three inches taller than Murray at 6’1). And even though he doesn’t yet have elite arm strength for a Major League Baseball project, it’s tough to question his ability to smoke a football into tight spots after his explosive 2018 with the Sooners. Now that Murray has indeed declared for the NFL Draft, he’ll have to prove himself through the pre-draft process while answering question after question about why he’s leaving baseball behind. 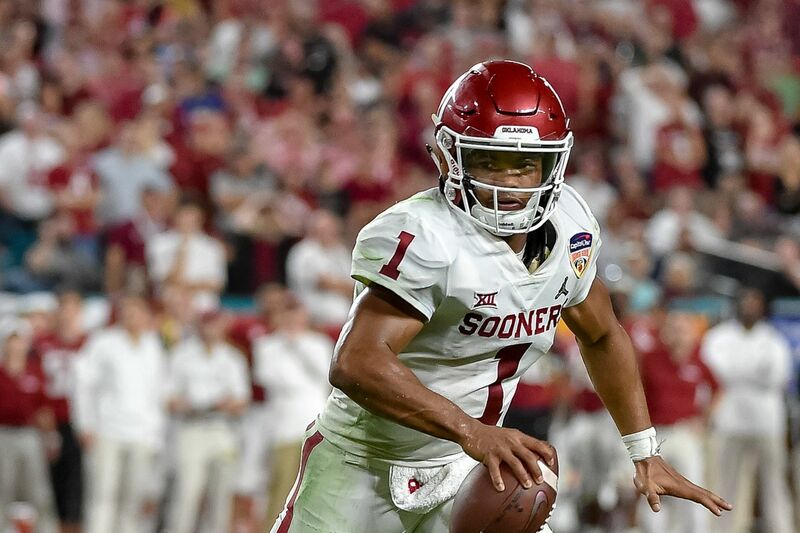 Any 5’10 quarterback will have his share of doubters in the big leagues — but the way the NFL has been trending, 2019 may be a better time than ever before for Kyler Murray to test the waters of the NFL Draft.